At nighttime Cera wakes up to hear Sharptooth. Eventually everyone is up but Littlefoot, but he comes around later while insisting there is no sharptooth. The shot of a crushed tree star is surprisingly long. I think that it symbolizes the need to go on without material possessions. Ironically it is just a symbol if not eaten. 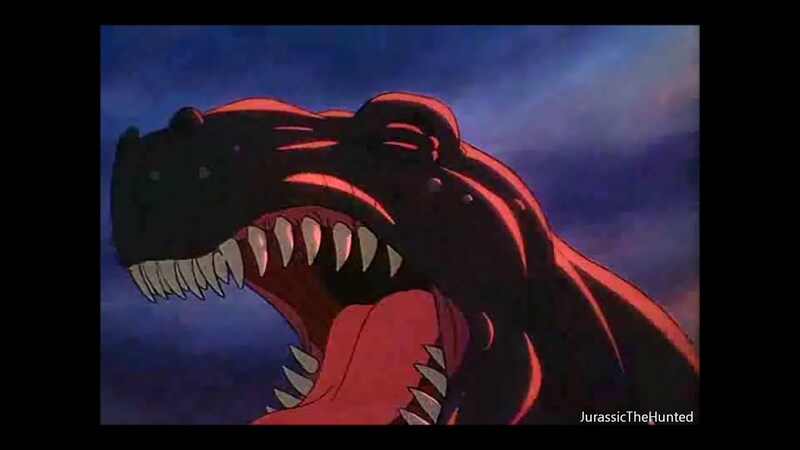 As a symbol of Littlefoot’s mother it also is a call back to Sharptooth killing her. I heard that in the deleted scenes he ate her body. Littlefoot makes up for his past mistake by getting Spike through a hole and directing theme in that direction in the first place, which Sharptooth got stuck on. That does not stop Cera from calling it his fault, but Littlefoot sees a rock that looks like a longneck (referenced in 5 and 13), which he knows is part of the way. They then continue on with triumphant music playing, and the animation makes it obvious this is a very physically tough journey through tough terrain. In one notable shot Littlefoot makes himself a dinosaur bridge, which Spike, Ducky, and Petrie take, but Cera goes around through a tougher path. Music is played at the top as if they are there only to find a little wasteland. Not knowing that The Great Valley is literally on top of the other group of rocks Cera leaves. “I am taking the easy way for once.” Ironically she just took an unnecessarily tough path, and she did it at the gorge to not follow Littlefoot. She is going out of her way to not take the best path, but she normally does go with Littlefoot. The problem is she now wants to go the wrong way due to its ease. Based on later evidence she probably does think it goes to The Great Valley. She eventually insults Littlefoot (not new, and he does not care) and his mother. That sets up a fight, where Spike humorously tries to hide (comic relief is appreciated here). Littlefoot and Cera’s fight goes back and forth until Littlefoot tries to leave, and Cera sucker slams him. Ducky, Spike, and Petrie also decide to go the easy way. Petrie tries to get Littlefoot to go with them, but Littlefoot stays with the path. According to the lost footage after this Littlefoot went over the rocks and found The Great Valley. After playing in a water fall he goes back to save his friends. I heard he goes back due to hearing his mother’s voice (knowing it is what she would want). I preferred the idea that when he got there he realized he had to go back. It makes slightly more sense in the narration, but the change of order keeps a clear finish. It does cost a villainous motivation (more on that later), but that is overall not needed. What it does cost is a very happy scene amidst a very low point, but I could certainly handle all this darkness until the more funny parts later. Augh! A strange creature scares them away. Cera screams for help until Ducky reveals it is them. Apparently the tar spit them out,,\ like I heard it does in real life (I never tested it). The rest get a huge laugh at Cera, especially as she tries to look brave but keeps tripping. She is too proud to admit her error and leaves. The rest find Sharptooth and decide to finish him off. In the deleted scenes Sharptooth is blocking The Great Valley’s entrance. Here the group just decides to kill him, but he is clearly blocking their path and has been a huge obstacle. Time to eliminate the obstacle. We are told Littlefoot’s plan meaning it will fail. Littlefoot and Spike will push a huge rock on his head and into the deep pond. Petrie gives a signal (as he is light enough presumably). 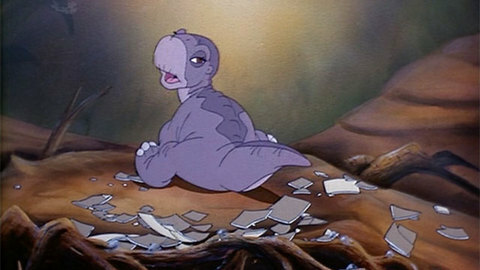 That leaves Ducky as bait, which some viewers have criticized Littlefoot for. I always felt she was the logical choice due to her role involving swimming. Sharptooth sees her coming and gets behind her, but she slips underneath him. Sharptooth quickly notices them and hits the rocks hard knocking Petrie off, but his breath lets him finally fly (referenced in 12). For some people their iconic moment seeing someone learn to fly is Superman. For others it is Peter Pan. For me it has always been Petrie. Petrie then gets Sharptooth’s attention off Ducky by pecking him, but he again jumps four times his own height by jumping right on the boulder trying to bite Littefoot and Spike. Petrie stops him by going for his good eye. This puts Sharptooth on the defense long ugh for Cera to show up and help push the rock with Sharptooth on it into the hole. Some have complained that all reptiles can swim meaning Sharptooth should be fine. My defense for the film is that a huge rock fell and hit him on the head knocking him unconscious. The rock stayed on top of him to drown him. It is also possible that he would have floated back to the top, but he would be unconscious long enough for the gang to get to The Great Valley. After a fake death with Petrie that still makes me cry Littlefoot is still despairing presumably due to thinking The Great Valley is still far away until he follows a cloud like how the Israelites followed a cloud through the desert that lead to a land flowing with milk and honey. It leads to The Great Valley. After one movie of build up and thirteen of results I am always filled with tears of joy when watching this scene. The gang goes in, as the narrator tells of how wondrous it is. They reunite with their families. Ducky’s family adopts Spike. Cera’s dad is being affectionate. Petrie literally makes enough wind to blow his siblings away and lift his mom. It has earlier been implied that they were near the extinction, but the narrator then squashes the last of the fridge horror by revealing that for many generations their descendants told the story meaning it is nowhere near the extinction. We then get a 40 second clip show that gives just the right closure by reminding of the good moments in this past hour instead of disappointment that it is over. It ends with “If We Hold on Together.” The song is a tear jerker before it even gives a single lyric, and it emphasizes continuing on amidst adversity. I love it. This is the greatest animated film of all time. Littlefoot is a terrific protagonist. He is a not-so-stoic who leads out of necessity of being the only one determined enough to make it. Cera is an anti-hero I really root for when she does good and root against when she does evil. Petrie has an incredible arc finding his bravery. Spike does not have much hidden intelligence except the part about being of the bottom of the tar monster. Ducky is the most moral character except, she is not good at thinking for herself. Arguably the speciesism part got dropped in mention, but that is because it shows how it ends, with no one mentioning or thinking about it because they no longer see their differences as bad. Ducks the only one who was not taught it, and she lead actually forming the herd. It is also why they are happy to adopt Spike. Some have said The Great Valley is Heaven instead of salvation in symbolism. That is false due to a simple detail, Littlefoot’s mom is not there. After the song some more music is playing that is used in the sequels and the series trailer. We then get to a logo for the man, the myth, the legend. Don Bluth. Then it is the Amblin logo ending another wonderful film, as it usually does. The new running time order is 10 (85 minutes), 14 (82 minutes) 12/11 (81 minutes each), 6 (77 minutes) 13 (76 minutes), 9/8/7 (75 minutes each), 5/4/2 (74 minutes each), 3 (71 minutes), and finally 1 (69 minutes). The new film rankings are 1, 5, 7, 3, 2, 6, 10, 8, 14, 4, 12, 11, 9, 13. Sometimes it says “The Adventure that Started it all.” Other ones still say “From the Creators of An American Tail.” The box itself shows the dark backgrounds and Sharptooth watching the main characters. It is hard to pinpoint the trailers due to the different rereleases, and my copy is from 1997 instead of 1988. My copy has the series commercial used in 6. It helped make me view this as a very good dark prequel when I was the target audience for the sequels. Now I view it as the greatest animated film of all time, and I need to capture both views. It has a different Universal Logo, and it seems to be of a galaxy. Unlike the others where I could barely find any behind the scenes details I could find plenty here. If I do not say where I got something assume it came from http://www.cataroo.com/DBland.html. According to Ani Mat they made the opening while still finishing the story, so they animated a generic opening for a dinosaur film. (https://www.youtube.com/watch?v=mIVcL9KPCvQ around the 2:50 mark). He implied it was the part with the narration and the dinosaurs moving, but that has plenty to do with the movie. I suspect it was the underwater scene. The underwater opening is incredibly beautiful. It even foreshadows four with the sea turtles. It waits a while to show the title, and the bubbles keep revealing the credits. It is directed by Don Bluth himself with Spielberg and George Lucas as producers. James Horner is the composer. The writers of An American Tail are back. I think this opening can be accused of not being useful to the film, but even if it is the 69 minute running time does not need to be shortened. It also shows a little swimming creature in constant danger foreshadowing how dark this film will get, thus it helps the mood. After the great opening it continues with our narrator, Pat Hingle. He gives us our narration to some more beautiful and ironically dead scenery. The plants are dying off (It is implied to be near the dinosaurs’ extinction, but that is revealed to be false at the end). The dinosaurs appear to rule the Earth, but in truth they are ruled by the leaf. They are following the setting sun (I am in the group that thinks the movie is filled with religious symbolism). I do consider this to be a one true, hard path to life, while a broad road leads to death. The Great Valley does not represent Heaven, but salvation. Even the original does not consider it to be Heaven. As a kid I knew it was made first but I did love that the original was about accomplishing a goal, and the sequels never did anything to reduce the happiness of the ending except make it more happy while still having plenty of plot. The leaf eaters only stopped to hatch. Ducky I the first one shown being born. I noticed at a young age along with many fans that Cera claimed to be the oldest in 5, but I always assumed they were just guessing their exact ages and Cera would arrogantly claim to be the oldest. Ducky has a birth that highlights her being overly trusting by putting her head in a snapping turtle like thing’s mouth. It highlights her innocence. Cera’s birth (referenced in 12) highlights her recklessness and fear that she seemingly has fear until a thunderbolt horrifies her (referenced in 2). Throughout the series Cera is actually very scared, and it is part of her character as a not so fearless character. As an egg Littlefoot is nearly taken by an egg stealer and he rolls everywhere. This is such an adorable scene. It also has a few references to Bambi. I do like how it shows Littlefoot being scared of his mother and her looking creepy to capture that babies are born scared and unaware of mother. It then stays such an adorable scene as he falls asleep on his mother. I am crying already. The Great Valley, so I think that wise older dinosaur would have replaced Littlefoot’s mom. Spielberg did succeed in cutting ten minutes of footage, which helped break up the duo of Don Bluth and Steven Spielberg. In the next scene Littlefoot is talking. The lack of food is evident especially as Littlefoot tries to eat a stick and the lack of leaves despite the surplus of trees. Littlefoot’s mother teaches him the path to The Great Valley. Littlefoot questions its existence since no one they know has ever been there (a theme brought up in 7 as well). As a seventh grader an above I always loved this symbolism about questioning salvation. As a younger viewer I did not care about the question, but the answer that it is believed in a heart not in a head. Littlefoot decides he will understand later. She then finds a treestar, and she gives it to Littlefoot. It becomes a symbol of her love at first, but it then changes to a symbol to material possessions and life. Littlefoot then hears a Threehorn playing, and he is excited about having a potential playmate. He sees Cera nearly eat an insect (if Hungary enough a Triceratops would eat meat). She gets sprayed by something and Littlefoot laughs. This draws Cera in who playfully wants to charge him, and Littlefoot seems to love the idea too. This is mostly comedic and some children having fun until Mr. Threehorn jumps between and demands Littlefoot leaves. He then tells is daughter “Come Cera. Threehorns never play with Longnecks.” Cera then repeats him. We already had a man vs. nature plot and now a man vs. society plot, racism/ speciesism. Cera has been taught it by her dad, and she copies him. Littlefoot’s mom explains it and she obviously accepts it as life. Littlefoot for a brief time does show some specieism (It does a wonderful job standing in for racisim in my opinion) later, by mixing a quote form his mom and Mr. Threehorn, but it is very brief and only shown once compared to the rest of the movie. Some say Littlefoot’s mother taught it to him, but she merely explained it, and I think it going wrong helps make her seem like a real parent. Sharptooth shows up. The original plan was for a more dramatic entrance that would be slower, while hear he only has a little build up. I actually really like that. I cannot compare it to the original plan, but instead of building him up like usual, he gets to be shown as menacing out of nowhere like real predators. He chases Littlefoot and Cera through a briar patch. Littlefoot tells Cera to go one way, but she goes a different way, and Littlefoot goes after her trying to get her to go his way. Cera’s way is big enough for Sharptooth to follow. Littlefoot accidently gets a thorn stuck in his eye, and I can hear Sharptooth’s pain. He is now motivated by revenge. This foreshadows some of Littlefoot and Cera’s future problems. Sharptooth gets in front of them, but mother comes to face him. Unlike most of the sequels’ fights this is very fast paced. Off note include Sharptooth getting warmed up by destroying a large rock nearly his size, and Littlefoot’s mother using her head as bait to hit him with her tail like Grandpa Longneck often did. I guess he taught her that. He then jumps four times his height to get on her back and rip off flesh. I am already getting really sad, while really enjoying the action. She successfully knocks him away. You can see the bloodless carnage that he presumably drank out of her. It looks good then until a huge earthquake comes and Sharptooth gets Littlefoot and Cera on his foot, and they all start falling into a huge cliff. 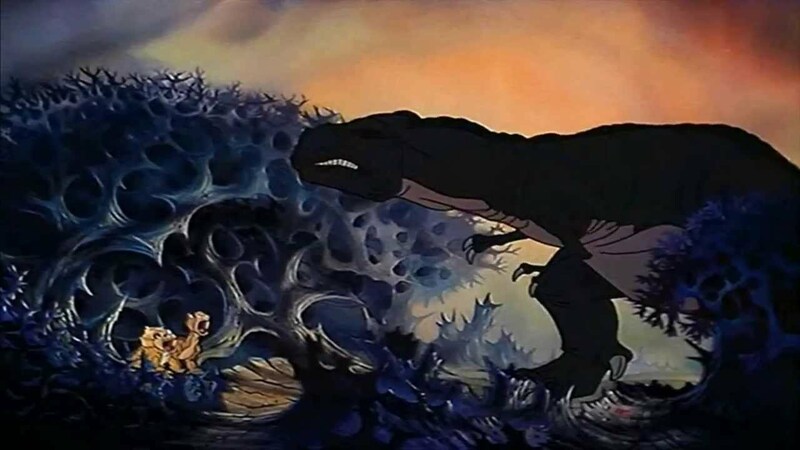 Littlefoot’s mother saves them, while Sharptooth presumably falls to his death. It then shows many dinosaurs and herds perishing in the earthquake. Cera and Littlefoot are separated form their healthy parents and grandparents. This next scene is sad no matter how many times I watch it. With the exception of Splinter’s death in the episode “Same as it Never was” I am never sad at off screen deaths, and to my tears’ misery she dies on screen. We do not even know she is dead until she is no longer talking. James Horner has done it. His soundtrack is the greatest ever. It can be so happy, so sad, and so exciting. She dies trying to keep her son alive by reminding him about how to find The Great Valley. I do hold on to the belief that this is Christian symbolism. I will not call it an allegory since I do not think the minor characters have important symbolic roles, but mother is Jesus. She is the sacrifice to keep everyone else alive when they wondered off the path. Littlefoot is then shown going through grief, denial, anger, sadness, and acceptance. I do not know about bargaining so presumably off screen. He runs into our narrator, Rooter. I neglected this in my review of 10, but a fan theory is Rooter told Bron about his wife’s death. 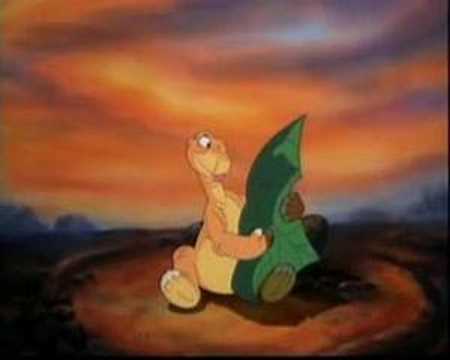 Littlefoot is doing a common Bluth trope, falling to symbolize a loss of sanity. He is blaming himself for wandering too far from home, Sharptooth for killing her, and his mother for not taking care of herself better. 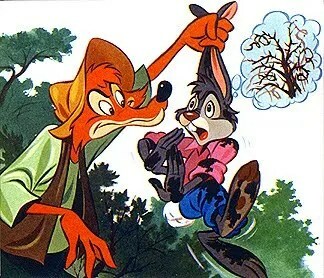 In a scene referenced in 2 and 4 Rooter explains the circle of life. Everyone eventually dies, but it does not actually end. As long as someone remembers what they taught and supported. It takes a few scenes, but it does start to sink in with Littlefoot. We then get very much needed very cute comic relief with some pterodactyls. It also shows that life goes on amidst tragedy. In another part he starts to hear his mother’s voice through the tree star. Littlefoot certainly considers it to represent his mother. I consider the following shadow sequence to be the movie’s saddest part. He thinks he saw his shadow as mother. It is so obviously not, and I am crying just thinking about it. Not even Babe or Gettysburg has a scene like that. After Littlefoot finally accepts that his mother is dead, and he has to live by finding The Great Valley so she will not be completely gone. This is still how I cope with loss. Littlefoot is someone who stays devoted to Christianity in the bad times. Some have called Cera temptation, but I consider her to be a person who makes problems, but needs to be saved. She is not an obstacle by design but due to her flaws she must overcome. 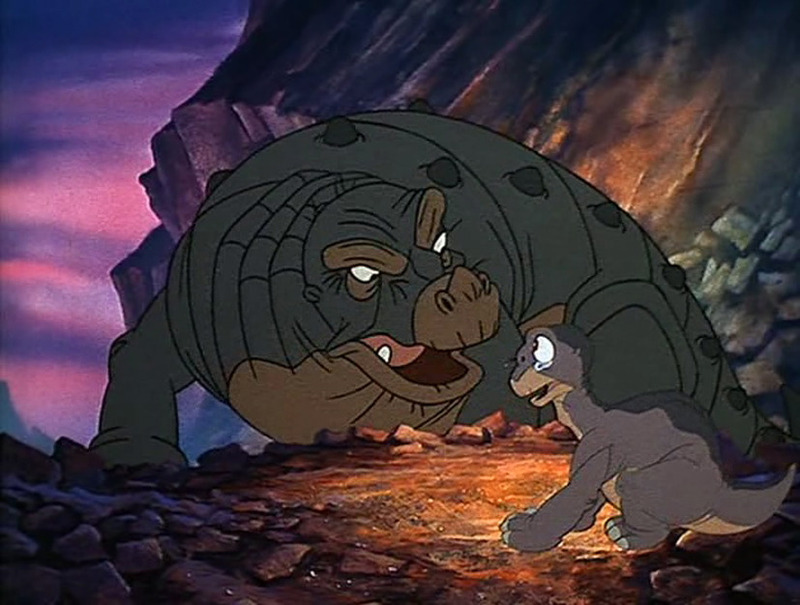 Instead of joining Littlefoot she remembers he dad’s words about being speciesist and tries to get over the great chasm. Littlefoot then is obviously hurt, and he does not want to join a swimmer, until her innocent happiness wins him over. Ducky is the overly innocent member trying to find out if Littlefoot or Cera knows the right way. They then meet Petrie (he was most likely left behind due to not knowing how to fly). Petrie’s actor, Will Ryan, is the only main actor to be an adult. If the other actors could not pull it off, then his role would have been greatly increased, but Judith Barsi exceeded expectations and got many of his lines. Petrie is a coward, but right away his sense of bravery is shown by him volunteering to be a guard and that he successfully climbed a tree, thus he at least is not consumed by fear. Cera accidently wakes up Sharptooth and flees in huge fear into the others. She makes up a story about fighting him off, which Cera an Petrie believe. My one problem with this movie is Littlefoot clearly believes Sharptooth is the only one even though the narrator earlier used the plural term. In the meantime Ducky finds Spike, a big eater who is too young to think much. In a deleted scene Cera wants them to leave Spike for slowing them down, but Ducky uses berries to keep him going. Unlike the herds in the opening they have multiple species. The next scene has simple parts like Littlefoot using water to find food, and Ducky and Petrie becoming friends. Confusingly Cera claims finding the food. Littlefoot is mad, and then some longnecks come in and eat it all. I eventually realized that Cera’s bragging got the attention of them, and they rushed in to eat everything. I am pretty sure that it was before the deleted scene with other herds. In another part of the deleted scene they met two types of dinosaurs. One had water, and one had food. They refused to share due to their differences, and it is presumed they will both die. Back in the trees the group minus Cera make a dinosaur ladder, and they get Petrie high enough to get a lo of food down and fall with style down. He hoped he flew down, but no one can honestly say yes. Cera refuses to join until Littlefoot tricks her into thinking she got some down herself, but it mostly increases her ego (brag bone). Cera and Littlefoot sleep in different areas, and the others pick who o join. Eventually even Cera goes to Littlefoot. Not necessarily “one” as in first film. Since many enjoy one or two based on nostalgia I want to start by saying I have no nostalgia for either film. I first saw two, while fifteen and one while sixteen. My only nostalgia for the An American Tail franchise is three episodes of Fievel’s American Tails and may trailers. When I was thirteen I became a huge animation fan with Don Bluth as my favorite animator. An American Tail is probably his second most well-known film and I really wanted to see it. I looked for it for years in thrift stores and online. I found the sequel and I thought it was a poor film. I finally found the first one on a website that only allowed me to watch fifteen minutes a day and I still loved it. I later got the movie and it remains a favorite that I watch every February, while “Fievel Goes West” barely gets watched. Despite being in my opinion the inferior film it may very well have qualities superior to the original, but they just do not work for me. The first one is Don Bluth, but the second one is more like a Disney film. There is the history argument of how ground breaking each film was and without a doubt the first film easily wins here. Before “An American Tail” animation was in the dark ages. Very little care went into them and very few made money. The producer of both films, Steven Spielberg, was having recent troubles, and “An American Tail” ended both problems. It brought Spielberg back on top and started the renaissance age of animation. “Fievel Goes West” was the first film made by Amblination. Only three were made, but the remnants helped form Dreamworks. Of course Amblination was made from the remnants of Bluth leaving Spielberg, which would mean the original is almost as responsible for Dreamworks as the sequel. The opening to one makes the crucial credits mistake of misspelling Fievel as “Feivel.” Still, it has a much better score in the beginning. It gives really nice animation. It then begins the action by both describing the American dream and showing the horrors the Mouskowitz are trying to escape. The beginning of II is more about just showing the West. The main theme is the same as “Bartok, the Magnificent” that there is a hero in you. I really do not see that developed. In one I very much see the theme that despite its flaws America offers the potential to change your life. Both films offer an early battle and here II is superior with the music. They use a modified version of the main theme that goes wonderful with an action scene. One has a mood breaking train sound effect, but one still has the better opening action scene. Granted, the difference is not by much. One mostly has a better scene due to a much bigger sense of fear and a better Fievel. Fievel was redesigned and it really hurt the second one. In II he was made to appear less vulnerable and older. Since the first one shows Fievel being very heroic it is reasonable to think he would be like that later. The problem is he gets himself into trouble more often in the second one and is far less successful in being a hero, which hurt the moral of the hero inside you. Even worse is Philip Glasser’s changing voice could not imitate its previous great performance. In the first one he comes off as heroic and capable of getting out of trouble. In II he comes off as an action survivor thanks to others saving him. From one he is one of my favorite protagonists, but it did not carry over. One reason for Fievel’s decreased role is the film was disneyfied. Don Bluth puts the main focus on the hero. Disney puts the main focus on the villain and side characters. It comes down to opinion and type of story which one is better, but I almost always prefer focusing on a wonderful protagonist. II is more of a Disney film than a Bluth film (Bluth did not direct it), which I am sure is a major reason for the broken base. Tiger is way more of the main hero than Feivel here. Dom DeLuise gives the best performance of the sequel. The problem is his lines are really bad filler mostly. The chases he gets in get really old before they even begin. At least he offers some good jokes and scenes. Wiley Burp is a horrible name. It sounds like something a Junior high student will make up. His whole fandom is based on being voiced by Jimmy Stewart and nothing else. Shouldn’t he have had a planned replacement already? Tanya gets a bigger role, which seems to be furry fan service. Mama and Papa are so much dumber, less caring, and less funny i the sequel. Mama went from a dead pan snarker to the miserable stereotypical mother. Papa was an optimistic but grief stricken dad to a straw optimist. In the first one I loved or really enjoyed every side character and they all had completely different roles. In II I liked Tiger and found everyone else to be bland. With their increased focus on the villain II should have an advantage there. On paper Cat R. Waul is better than Warren T. Rat. He is smarter, has a more complex plan, he has a better voice actor, better actor gave a great performance, he has a more menacing sidekick. His sidekick, the tarantula is actually a better villain. On screen Warre is better. He is far more threatening. With Cat R. Waul I doubt he would hurt a fly, mostly because he prefers to not kill anyone personally. Warren is also more interested in money than killing, but he always comes off as more murderous and optimistic about future success. He also has a much better plan. Cat R. Waul wants to use mice for their labor. The way to do that is to clean the big machines or something. Instead they are shown struggling with a job that a cat solves in literally three seconds. I was actually fine with the mouse burgers plot since badly worded plans happen, but it is still a minor problem. Warren I better at making a believable plan and being a more relatable villain, the oppressive upper class who only want to make money. Cat R. Waul is still the third best part of II. The best part of II s its climax. It is fun and even Miss Kitty works in it. I liked the slingshots. Fievel also finally got to do something notably important. Still the climax in one is leaps and bounds better. The part with the Great Mouse of Minsk is wonderfully animated. The songs in An American Tail are my favorite in any musical. Each one is better than the last, and they add to the story and characters. “No Cats n America” further ads to why the mice are so scared of cats by focusing on the sadness (earlier scenes focused on the horror). “Never Say Never” (besides being ripped off by Justin Bieber) is very important to letting the characters get over a sad time and doing the same with the audience. It also stays in the head and ads hope later. Why is “Somewhere out There” so great? It does not try to sound pretty, but true. The characters do not change their voices. Besides that it is wonderfully written and fits untrained singers. “We’re a Duo” is just wonderful. It really helps with the symbolic message of the cats being the oppressive upper-class to the mice’s immigrants showing how both are needed. Also to help is by then it is so great to see Fievel finally find a friend who does not get distracted from helping him (Tony was mostly useful later). The final ingredient was Tiger. He was instantly likable. It is also made even better by the sequel, which is to Fievel Goes West‘s credit. I never understood the love of “Dreams to Dreams.” Of the flagship songs from all four movies it is the worst. It sounds like it was made not sell rather than add to a story that sells, like Disney films typically make. Her ice is way too focused on sounding pretty rather than getting emotion out. Miss Kitty’s song is something I always want to fast-forward through. “At Least ay out West” is a really good song, but overly loud for my tastes even for a crowd song. I see why some people love the second one. It offers several things to like for Disney fans and nothing is notably bad to distract from it. It still cannot compete with the first film. The first films a wonderful protagonist, my favorite songs from a musical, wonderful animation, a threatening villain, and a wonderful moral both literally and symbolically.